I have learned that work/life balance is a challenge for the baby boomer generation, as we fulfill most – if not all – stereotypes by habitually engaging ourselves in more responsibilities than hours in a day. But, after more than 30 years into my career, I knew the time was right to give back in some way. I spent months trying to discern how I could use my professional experience, and connect the dots to something that held deep personal meaning – something from the heart. Marketing and business development is what I do at Environmental Design Group, but it doesn’t tell the entire story of who I am. There was more of me to give. I finally reached an epiphany and joined a non-profit Board. Being a perfectionist, I always like to have all my ducks in a row, so of course I had to give great thought to next steps and making the right choices. After all, perfectionists don’t want to make mistakes. Ironically – or perhaps not by chance at all – a favorite quote from Mother Teresa kept resonating in my mind. ” In this life, we cannot do great things. We can only do small things with great love.” Yes, that said it all. Doing good things for others has always tugged at my heart. Okay, so now what? Do I lobby for myself or get others to put in a good word for me? Do I send out letters and resumes or make a lot of phone calls to organizations that are relevant to my interests and provide service to the elderly, the homeless or those who have disabilities? Within two weeks, I was having lunch and catching up with a former supervisor who had recently retired, but was still serving as Chairman of the Board for Weaver Industries – a long-respected non-profit organization in Summit County that provides individuals with disabilities vocational training and employment opportunities. I quickly planted the seed of interest. He quickly responded, and I had found my home. Almost simultaneously, I found out that our company was beginning to talk with area organizations about employing an individual with a disability within our firm. This was a decision that had nothing to do with me or my involvement on the Weaver Board, but I took it as a “sign” or affirmation that all things were somehow connected. Once Don started with us, I was certain that I would somehow make a difference in his life. 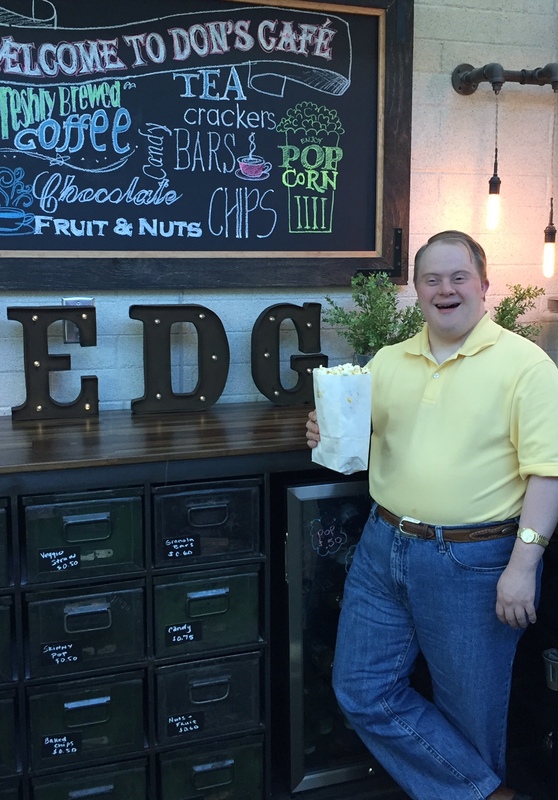 Don became part of the EDG family – stocking our Café, emptying recycle bins, setting up for Lunch and Learns, and his favorite…making popcorn on “Popcorn Fridays.” Small things with great love. Am I giving back in some way? Perhaps. But maybe…just maybe…it really wasn’t about my skill set or the time I had to give after all. Maybe the best choices in life are the ones we don’t make for ourselves. Because at the end of the day…at the end of “Popcorn Fridays”…the gift I thought I was giving…was actually being received.